Create a photorealistic presentation for your personal or client artwork, pictures or pattern designs using this wall art mock-up. The PSD file includes smart objects to allow you to easily place your design on the wall or change the floor. To obtain the right look for your presentation you can also change the color of the chairs. Big thanks to pozitivo for providing us with this awesome freebie. 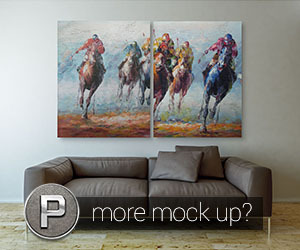 If you enjoyed this resource then check out the full collection of Wall Art Mock-ups.